Ian and Margaret Gray at their Mosstowie home, near Elgin. A final option for the project is due to be unveiled by Transport Scotland at a series of public exhibitions to be held in the region within the next fortnight. However, residents who live near one of the proposed routes have demanded that the government agency ends the uncertainty by announcing it at the earliest possibly opportunity, without waiting for the events. 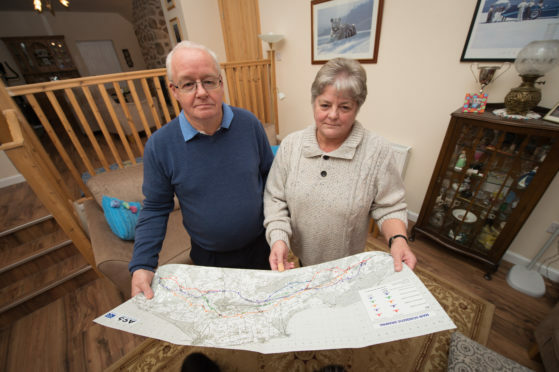 Ian Gray, whose Mosstowie home is less than the half a mile from the bypass option to the south of Elgin, believes locals should know how their homes are affected as soon as possible. The retired chef said: “If they’re getting the public exhibitions organised then they probably already know where they want to put the road. “They should get it out there now instead of waiting. “We chose to live here because we like the countryside. “If they pick the southern route then a big roundabout is going to be built here. “I probably won’t see the road but I’ll certainly hear it. Transport Scotland is due to confirm its preferred option for the upgraded A96 dual-carriageway between Hardmuir, near Brodie, and Fochabers on December 4. The announcement will trigger another consultation period before the Scottish Government agency confirms the final route for the road. The project between Aberdeen and Inverness is being completed in phases and is due to be completed by 2030. Public exhibitions have been organised in the Mansefield Hotel in Elgin on December 4 and 5, Speymouth Hall in Mosstodloch on December 6 and Forres Town Hall on December 7.